Trainer-teacher-learners worldwide are on the cusp of a magnificent collaborative opportunity: participation in Open Education Week, which runs from Monday – Friday, March 11-15, 2013. Ostensibly for those involved in formal academic education programs, this is an opportunity that should appeal to anyone involved in the numerous entities comprising our global learning environment: K-12 schools; colleges, universities, and trade schools; libraries; museums; workplace learning and performance (staff training) programs; professional associations and organizations like the American Society for Training & Development (ASTD), the American Library Association, and the New Media Consortium ; and many others. It’s a chance for us to collectively examine the roles we can play together to tackle the wicked problem of reinventing education and developing ways to effectively support lifelong learning in a world where we can’t afford to ever stop learning. At the heart of this endeavor is the open movement—the latest of the five massive themes that we’re exploring in two-week bite-sized segments within #etmooc (an online Educational Technology & Media course), that massive open online course (MOOC) developed by Alec Couros and his wonderful gang of “conspirators.” The course itself is a living example of the spirit of open, and it is quite literally transforming not only those who are directly participating in it, but also those who are learning about it and participating vicariously through the blog postings we are producing and sharing openly, the Blackboard Collaborative sessions that are archived and openly available, the live tweet chat sessions and numerous unfacilitated stream of tweets it is generating, exchanges in a Google+ Community, YouTube videos, and various other rhizomatically spreading learning opportunities that will continue having an impact on learners worldwide long after the current January- March 2013 offering comes to an end. It’s a movement I first encountered several years ago within the pages of Wikinomics: How Mass Collaboration Changes Everything, by Don Tapscott and Anthony D. Williams, and that we all can continue to explore through the #etmooc panel discussion moderated earlier this week by Alberta Distance Learning Centre learning innovation lead teacher Verena Roberts. 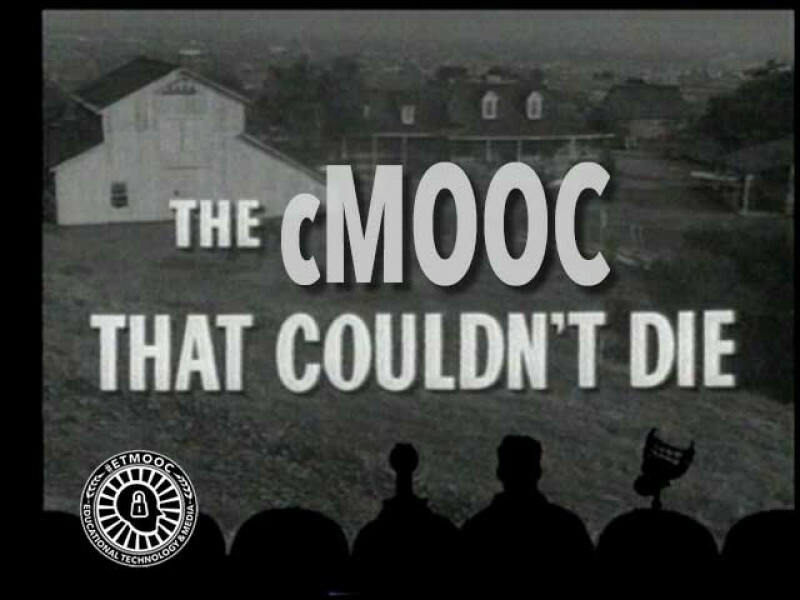 As has been the case with the handful of #etmooc presentations I’ve been able to attend or view, this one provides great content while also serving as an example of what it discusses. It was held as a Google+ Hangout to make it as accessible as possible; it was live-streamed on Roberts’ YouTube channel; interactivity between the panelists and learners was facilitated across platforms, including a Google Doc that also is openly accessible; and it is taking on a life of its own through tweets, blog postings, and other openly-shared resources. To watch the recording of that hour-long Google+ Hangout panel discussion is to sense the power of online learning and engagement while receiving a full immersion that leaves us with hours of material to return to at our own leisure. We see and hear Mozilla Foundation staffers sharing resources and encouraging us to participate in them, e.g., through the Mozilla Festival and efforts to help define digital literacy. We learn about a magnificent repository of open resources curated under the title “Open High School of Utah OER [Open Educational Resources] Guide” under the auspices of the Open High School of Utah (which will become Mountain Heights Academy in fall 2013). We hear panelist Christina Cantrill, from the National Writing Project, suggest that open is about resources, but “is also about practices.” And we walk away from the session with a clear understanding that four basic tenets of the open movement are reusing, revising, remixing, and redistributing content without losing site of the fact that we still have an obligation to acknowledge the sources upon which we draw. For those of us wanting to continue our explorations within the context of the Wikinomics model, we turn to another variation on the open theme: the TED (Technology, Entertainment, and Design) talk—“Four Principles for the Open World”—that Tapscott delivered in 2012. He takes us a bit deeper into the open movement by suggesting that there are four pillars of openness: collaboration, transparency, sharing, and empowerment: “The open world is bringing empowerment and freedom,” he tells us at one point. The fact that these brief but stimulating explorations of openness take us from Open Education Week’s key themes of “connect, collect, create, and share” to those four tenets (reusing, revising, remixing, and redistributing content) on to Tapscott’s quartet of collaboration, transparency, sharing, and empowerment confirm that we’re facing the same wicked problem here that we face in digital literacy/digital literacies: settling on a firm definition is a far-from-completed endeavor. We aren’t, at this point, anywhere near achieving that goal. But Tapscott, by introducing us to the concept of murmuration near the end of his TED talk through a video showing an exquisitely beautiful murmuration of starlings, provides an example from nature that should inspire all of us to start by participating and collaborating in Open Education Week (conversations on Twitter will be organized though use of the #OpenEducationWk hashtag and nurtured through the @OpenEducationWk Twitter account) and then incorporating open practices into our training-teaching-learning endeavors wherever we can. N.B. : This is the nineteenth in a series of posts responding to the assignments and explorations fostered through #etmooc. When a friend and I first read about Chicago Mayor Rahm Emanuel releasing a stream of expletives and walking off of Sean Hannity’s Fox News program in November 2012, we immediately began an online search to locate a video of that explosive moment. I’m admitting up front that our search wasn’t driven by skepticism; we simply wanted to see the altercation with our own eyes. And within a couple of minutes, we not only had determined that there was no footage to be viewed, but that the original source—The Daily Currant—clearly identifies itself, on its “About” page, as “an English language online satirical newspaper that covers global politics, business, technology, entertainment, science, health and media.” The site also informs readers that the stories “are purely fictional. However, they are meant to address real-world issues through satire and often refer and link to real events happening in the world.” But we had to take the extra step of looking at the “About” page, because nothing on the page containing the original story hinted at anything other than a news report posted by on online publication. Think of The Daily Currant as an online version of The Daily Show on Comedy Central or a subtle version of The Onion. And also think of it as a reminder of the need for finely-honed crap detection skills—one piece of the overall skill set seems to be an integral part of any definition we can create for our constantly evolving sense of what “digital literacy” means in its broadest as well as its most specific sense. 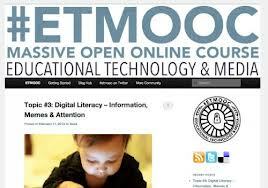 Digital literacy is a theme many of us began exploring a few weeks ago within the context of a wonderful massive open online course (MOOC), #etmooc, the Educational Technology and Media MOOC that Alec Couros and others are currently offering through March 2013. For a couple of weeks and with the guidance of some wonderful learning facilitators, we struggled with the wicked problem of trying to create a workable definition for digital literacy—a term that appeared straightforward at a glance but that proved to be incredibly nuanced, subjective, and complex as we gave it increased attention. But there’s nothing nuanced or complex about the obvious need for highly-developed crap detection skills in our onsite-online world—a theme brought into full focus for us through Howard Rheingold’s #etmooc digital literacy presentation on “Literacies of Attention, Crap Detection, Collaboration, and Network Know-How” last month. Picking up on themes he has obviously covered elsewhere, he talked about walking his daughter through the process of exploring a website that initially appeared to be an official site about a well-known historic figure, but eventually turned out to be a far-from-objective source of information. He also recalled taking an online pregnancy test that confirmed he was going to give birth to a baby girl and that the father of his child was Fabio Lanzoni. If laughter helps us learn, then we should acknowledge and thank The Daily Currant, The Daily Show, The Onion, @FakeLibStats, and many others for helping us hone that part of our digital literacy skill set covered by the concept of crap detection. And, in the meantime, let’s see if we can track down confirmation that the U.S. Department of Homeland Security is demanding that Donald Trump produce a copy of his birth certificate so he can be assured that he won’t be disqualified, as a non-citizen, from running for president if he ever again considers pursuing that path. N.B. : This is the seventeenth in a series of posts responding to the assignments and explorations fostered through #etmooc. Let’s begin exploring our quickly changing ideas about digital literacy by noting the various skills required to engage in a contemporary online learning experience: a live session (now available in an online archived version) on digital literacy/literacies led by Doug Belshaw for #etmooc, the Educational Technology and Media MOOC (Massive/Massively Open Online Course) organized by University of Regina professor of educational technology and media Alec Couros and others. If we really begin with the basics, we have to start by navigating time zones since the session starts and ends at different times depending on the time zone within which you’re living (noon, PT, on Presidents’ Day/Washington’s Birthday 2013 here in San Francisco, 8 pm in Northumberland, England, where Belshaw is facilitating the live session that initiates a two-week course of study on digital literacy). Then we have to find our way into the online session within Blackboard Collaborate—recognizing that we’ll need a desktop, laptop, or mobile device to access the session. Once we’re there, choices abound. If we simply want to observe, we can stay within the Blackboard Collaborate platform, watch, and listen. (Watch out for that live chat stream flying past us on the left-hand side of the screen—another skill to master.) Or we can actively participate by using our skills to engage in that online chat. We can go a few steps further by using online tools to place symbols on the map at the beginning of the session to show where in the world we are while participating, or draw/type responses to questions posed on some of the slides displayed during Belshaw’s presentation, or use the live VoIP interface to actually ask questions. If we’re having trouble seeing the slides through the Blackboard Collaborate presentation, we can hop over to SlideShare and view the slides there—knowing they will remain on SlideShare as a resource to us and to other learners long after the live session has ended. But wait: we’re far from finished. Belshaw invites greater levels of interactivity through use of yet another bit of free software—Etherpad—if we want to participate in a few live exercises, including the act of individually and then collaboratively defining digital literacy to show how our own ideas evolve during the hour-long learning opportunity. 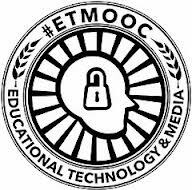 We can also return to Etherpad, after the session ends, to review what we’ve accomplished together within this #etmooc session and also view a variety of links to other resources that were mentioned during the live session. And there are even a few people out there carrying on yet another backchannel discussion on Twitter via the #etmooc hashtag; postings in our Google+ community and our blog hub can’t be far behind. Having mastered at least some of these skills, we’re now in a position to actually deal with the fabulous content and begin defining and understanding what digital literacy/literacies means to any of us involved in training-teaching-learning. At the heart of this one-hour session is Belshaw’s wonderful digital literacy version of a periodic table comprised of the eight essential elements of digital literacies he developed for his Ph.D. thesis publication: Cognitive (Cg), Constructive (Cn), Communicative (Co), Civic (Ci), Critical (Ct), Creative (Cr), Confident (Cf), and Cultural (Cu). 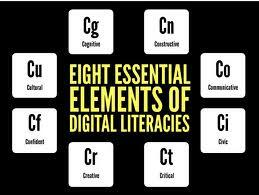 If we now step back and take a long, deep breath, we see the bigger picture of digital literacy/literacies and learning. What we’re obviously dealing with in a session like this one is the challenge of processing the deluge of information and information resources coming our way—which means that a major skill to develop is how to focus on essentials while sifting through the huge number of claims on our attention documented in this article. Recognizing that an ability to multitask while engaged in complex cognitive endeavors (e.g., learning) is largely a myth, it seems to me that a basic element of digital literacy/literacies is recognizing and acknowledging what we are and are not capable of doing; compensating for what we cannot do; and finding ways to gain as much as we can from our digital experiences so that we can be successful rather than being overwhelmed. And if this review of some of what happens during a dynamic and wonderfully rewarding one-hour learning experience leads us to a better understanding of what we (and our learners) face and how we can resolve some of our learning challenges, it has helped bring us one step closer to developing the sort of digital literacies #etmooc and its creators and facilitators are inspiring. N.B. 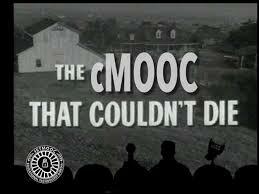 : This is the ninth in a series of posts responding to the assignments and explorations fostered through #etmooc. You have searched the Building Creative Bridges blog archives for ‘#etmooc’. If you are unable to find anything in these search results, you can try one of these links.